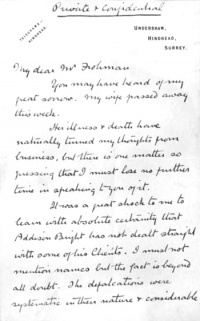 This letter was written by Arthur Conan Doyle from Undershaw, Hindhead, Surrey, on 4 july 1906  to Charles Frohman, an American theatrical producer, co-founder of the Theatrical Syndicate. You may have heard of my great sorrow. My wife passed away this week. Her illness & death have naturally turned my thoughts from business, but there is one matter so pressing that I must lose no further time in speaking to you of it. It was a great shock to me to learn with absolute certainty that Addison Bright has not dealt straight with some of his Clients. I must not mention names but the fact is beyond all doubt. The defalcations were systematic in their nature & considerable in amount. Since he has treated others so I cannot doubt that I am also a victim, since I have trusted him most absolutely and seen no vouchers of any sort. It seemed to me that we might make a test case of a single account. If it is wrong all are probably wrong. 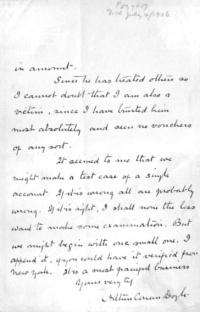 If it is right, I shall none the less want to make some examination. But we might begin with one small one. I append it, if you could have it verified from New York. It is a most painful business. ↑ According to annotation on letter. This page was last edited on 14 February 2018, at 23:28.